sea routes, major airports and time zones. his easy-to-read map has a scale of 1:40 000 000 and contains cartographic information you can trust. longitude and latitude, time zones and world facts. time zones indicated with easy-to-use clocks, island names and ocean depths are indicated. I will respond ASAP Monday to Friday. 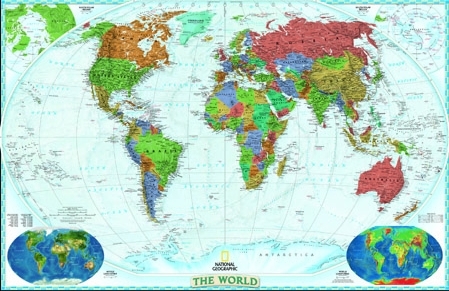 time zones indicated with easy-to-use clocks, island names and ocean depths are indicated. Packaged in a convenient tube. capital cities, latitude and longitude, international date line, north arrow, equator and tropics and river systems. All rights reserved E. & OE. Terms and Conditions Apply.